In September 2018, Bri Malandro retweeted a Ciara photoshoot from the autumn/winter issue of King Kong magazine. In each photo Ciara is wearing a cowboy hat, paired with billowing sleeves and glossed lips, leather belt harnesses and waist clutching corsets; a cross necklace for good measure. “The yee haw agenda is in full effect,” Malandro wrote. Malandro’s coining of the phrase couldn’t have been better timed, but as a pop culture archivist, it also meant that she was simply paying attention to what was already brewing. The resurgence of country-western style was fully underway throughout 2018. Yodeling Walmart kid—Mason Ramsay—went viral. “Space Cowboy” singer Kacey Musgraves became a sweetheart of music critics and reluctant country music fans. The buzz surrounding Mitski’s album Be the Cowboy was such that it became a meme. Designer Batsheva Hay caused a stir (and controversy) with her prairie dresses. 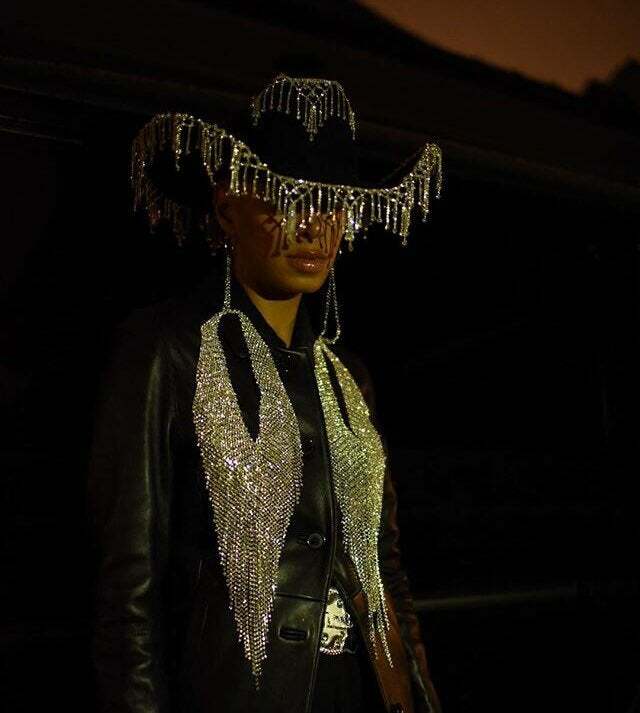 Fashion label Pyer Moss featured modern-day cowboys and cowgirls of color, and their narratives, in a campaign that fall. The cowboy emoji got plenty of use in 2018, and it continued into the new year. By February 2019, Cardi B was rocking a cowboy hat in the “Thotiana” remix video and was grinding in pastel chaps; rapper Megan Thee Stallion became an overnight sensation and rocks a cowboy hat with ease; and Solange was teasing clips from her upcoming album, decked out in shiny snakeskin cowboy boots. By March, the “yee haw agenda” had exploded. There were think pieces, trend pieces, and even thinkier think pieces. Pitchfork explored the reclamation of traditionally white cowboy imagery by women of color artists like Mitski and Solange; Teen Vogue offered readers a brief history of black cowboys and a shopping guide to rocking yee haw. And to Malandro’s disappointment, Rolling Stone published a piece about the yee haw agenda without mentioning her role in its popularity (the piece was subsequently updated to credit her). As a result, Malandro has filed a trademark application with the U.S. Patent and Trademark Office for the phrase “The YeeHaw Agenda.” Records show that the application is pending. And as much as Malandro appreciates the love that the yee haw agenda has received, she admits that some interpretations have taken the fun out of it. “It was 1000 percent supposed to be fun,” Malandro told me when I initially reached out for an interview. But once a new phrase enters the internet’s lexicon, its meaning and purpose become fuzzy. It was just me having fun and going up for the looks, specifically by really fly black girls and boys in cowboy hats. Malandro and I have been mutuals online for years, ever since the early 2010s when she used her Tumblr account as an archive of ‘90s and ‘00s pop culture eye candy, with a heavy focus on black women. Malandro is an endless vessel of knowledge about everything from video vixens of the 2000s to whatever the hell Janet Jackson’s bangs were doing in 1997. So the yee haw agenda is her wheelhouse, as she documents the holy union of the old west style that defines her Texan roots and black glam. And while deeper meaning has been projected onto the yee haw agenda in good faith, for Malandro it’s the aesthetics that define it at the end of the day. We spoke via email about the yee haw agenda and what the media is getting right and wrong about it. The interview has been edited for clarity. JEZEBEL: How was the term “yee haw agenda” born? BRI MALANDRO: It’s a play on “the gay agenda.” My mind works in mysterious ways and it kind of just came to me. You’re from Dallas, Texas, and rep the state heavy. Has that had an impact on your affinity to the cowboy aesthetic? Absolutely. You can’t really go anywhere in Texas without seeing at least one person in a cowboy outfit. I went to see Manny Fresh on Fat Tuesday earlier this month and there were several people in there repping the agenda. My father also played for The Dallas Cowboys for a very brief part of my childhood and I remember my mom always having some calf hair boots on deck when it was time to go out. What images immediately come to mind when you think of the yee haw agenda? Beyonce in that flaming leather cowboy hat on the “Independent Women” single cover has to be first. But she wore it in Amil’s “I Got That” music video too. There’s a picture of Ananda Lewis in this cowboy hat with a rhinestone heart in the middle that sticks out as well. She’s one of my favorite people ever to cross my television screen and was way ahead of her time, style-wise. Nicole Wray’s “Make It Hot” album cover is important to mention, Naomi Campbell’s 1998 Paper magazine shoot, Ciara’s 2018 King magazine shoot, Solange in that black cowboy hat with those really huge teardrop earrings. I could go on. The sudden popularity of the yee haw agenda has launched a slew of articles, including some that have gone on to do deep dives into blackness and Americana. What’s your take on the takes? I get where those articles are going, but to be honest, for me it’s literally just about the aesthetic. I think nowadays people like to make everything into a think piece or some really deep historical conversation but that’s not why I started saying that at all. It was just me having fun and going up for the looks, specifically by really fly black girls and boys in cowboy hats. Are we just living in a moment where the cowboy regalia is a fun trend, or do you think this is a cultural moment that’s a little deeper than pure aesthetics? I think it’s a bit of both. Obviously it’s super trendy right now, but I always go back to the early 2000s when Mary J. Blige and NSYNC were really into the look as a reference point. The trend will die down eventually, but history is just going to repeat again and again, so expect another resurgence in 2040. As far as it going beyond just being an aesthetic though, seeing more black ranchers—shout out to Pam Grier!—and more black people in general making the rodeo an event would be dope. One of my friends, Jordan King, came up with a really cool idea of having some type of yearly ball, similar to The Player’s Ball, where people get super dressed up in their best western wear to party and show off. I’d love to see something like that happen, for real. Do you think it’s subversive for black Americans to don cowboy regalia? Or is the cowboy mystique just as much theirs as it is anyone else’s? I don’t think it’s subversive at all! I still don’t know who John Wayne is. What haven’t you liked about the sudden popularity of the yee haw agenda? There’s nothing really that I haven’t liked other than people being weird about not giving credit for certain things, but that happens almost everyday. The content game is so cold and messy sometimes (all the time). Tell me a little about your Instagram account @theyeehawagenda. It’s the best account on instagram and I’m not being biased. It really is the best. I think everyone reading this should follow and submit themselves pushing the agenda forward. I would like to see it.